This may be a day of hard work for you but does it really need to be that way? If you look at the scene bathed in sunlight through the stone slab what do you see and what does it represent for you? The stone pillars show that there is hard work that is needed, laying the foundations down to get what you want and also perhaps putting in a little of your imagination into things to get what you want in the process. In the pillars of stone surrounding the image you will see a crescent moon on top of the stone pillars which looks to sit on top of two stone hands clasped together. Such is the effort you are willing to put into your current project to reach your dreams… it is as if you rule yourself with an iron fist and will not take any setbacks sitting down. So what is it you have been forging to build and how much effort have you been putting into it possibly at the expense of other areas of your life and people being neglected? The dream you are searching for is already in front of you and what a glorious sight it already is. A beautiful clear summer’s day, a calm sea and the sun shining without interruption. There are no ifs, ands or buts to your outcome there is only the question of “when will it happen?”.Perhaps this question can only be answered by you and if you are looking for something else to do today you may wish to open your eyes to how much you have already accomplished for that which you have been striving to create is already in your life. you just need to see it and in doing so decide within yourself that you are going to enjoy the fruits of your labour and give yourself a well earned rest. 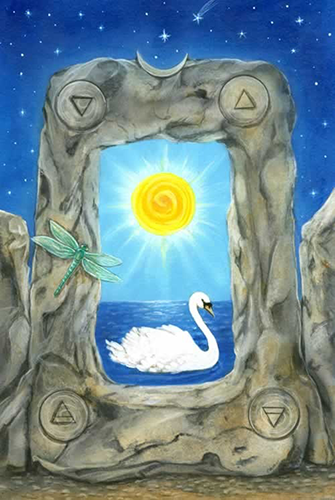 The card used for today’s tarotscope — Four of Pentacles — is part of the self-published Star Tarot series by Cathy McClelland. This is a 22-card Majors only deck which is sold out. However Cathy has signed with Schiffer Publishing and is in the process of completing the deck. She is working on the Minors at present. Check back with Cathy on her website to see the progress of this beautiful deck! Used by generous permission.